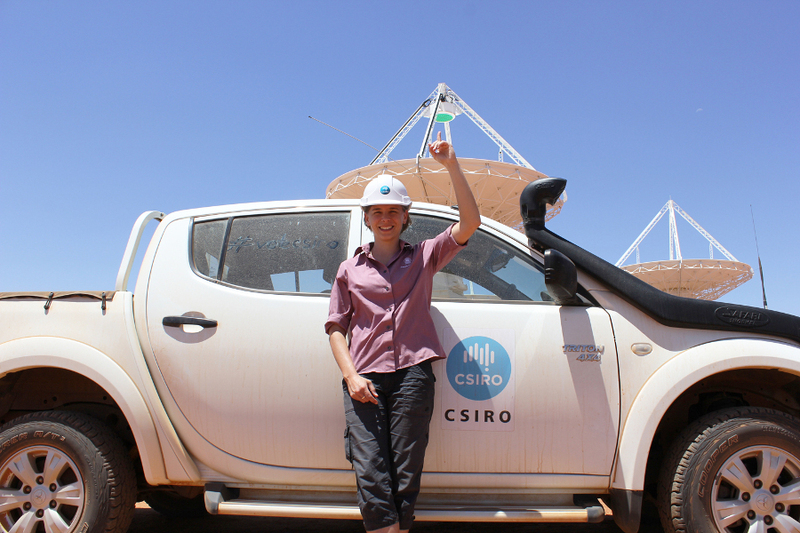 Dr Lisa Harvey-Smith pointing to the Phased Array Feed (PAF) on an ASKAP dish. Our scientists have weighed in on the idea of measuring a supermassive black hole and it’s come in at a whopping 3.8 billion solar masses – equivalent to one quadrillion Earths. At this mass the supermassive black hole at the centre of the distant galaxy being studied, outweighs our own Milky Way’s supermassive black hole by a factor of approximately 1000, estimated at a mass of just 4 million suns. Maybe it’s just as well our closest black hole is relatively small given the fact that material that gets too close gets sucked in and can never escape – a fact put to good use by the Simpsons. Fortunately for us, astronomers assure us that Earth won’t be sucked in anytime soon. But how did our scientists actually get to weigh one of these fascinating and mysterious objects? 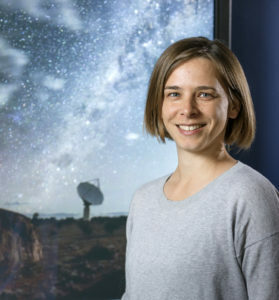 Dr Lisa Harvey-Smith, one of our astronomers working on the ASKAP project, made the measurement using the ASKAP and the Australia Telescope Compact Array (ATCA). Dr Lisa Harvey-Smith, CSIRO astronomer with ASKAP. Dr Harvey-Smith and her colleagues used these telescopes to observe a bright radio source called a ‘mega-maser’ in a distant galaxy, approximately 1.7 billion light years away, called IRAS 20100-4156. An astronomical maser can be described simply as clouds of gas that are amplifying radio waves and creating a luminous effect. They are not a single object in a galaxy but more an effect that is occurring in gas clouds throughout the inner regions of the galaxy. This particular mega-maser is a result of a trio of spiral galaxies colliding, causing a disruption and in turn a burst of star formation, resulting in a mega-maser at the centre of the range of galaxies in this system. A mega-maser is one million times more luminous than the masers we see in our own Galaxy. What does the mega-maser have to do with weighing a black hole? The clouds of gas that make up the mega-maser are rotating around the black hole in the centre of this distant galaxy. By measuring the speed of their rotation and using a simple mathematical equation, scientists can estimate the mass of the black hole, which in this case turned out to be a super massive black hole with a mass of approximately 3.8 billion suns. In the last decade, scientists have come to believe that black holes are not only common throughout the Universe but they play a fundamental role in the formation and evolution of galaxies like the Milky Way Universe that we inhabit today. And ASKAP is key to our ability to unlock further secrets and uncover new phenomena that will help us understand the nature of life on earth. An important angle of this research is that it has demonstrated the capacity of ASKAP to provide the data needed by astronomers to study some fundamental questions about the evolution of our Universe. To be sure that the data are accurate, there need to be checks and balances to ensure the ASKAP technology is working as planned. To do this, the team compared two independent data sets, one captured by ASKAP BETA’s array and the other captured by ATCA. The results matched, confirming that ASKAP is working as hoped, fulfilling one of its key roles of pioneering revolutionary new technologies as part of Australia’s contribution to the design and development of the international SKA project. This scientific work uses data obtained from the Murchison Radio-astronomy Observatory. We acknowledge the Wajarri Yamatji people as the traditional owners of the Observatory site. I was curious as to the type of megamasers studied – hydroxyl, water, or another molecule? Why then is our galaxies black hole so relatively puny then? Especially in the light of the recent news that our galaxy has at some time in the past merged with another, and presumably the black holes became one also totalling just 4 million suns. Thanks for the question. It depends on a number of factors, including the original mass of the black hole, the number of mergers undergone, how much of a ‘direct hit’ they were and the amount of gas in the galaxies. The galaxy in the article is an absolute whopper and has presumably undergone several mergers in its life.